I'm talking about a major uptrend in Chinese blue-chip stocks. When most investors hear the word "China" they get worried. And when you add in Trump's recent rhetoric, investor fears grow even more. That's fine with me! I started True Wealth China Opportunities in September to take advantage of the bull market I believed was coming. I predicted that hundreds of billions of dollars would flow into Chinese stocks in the next five to seven years. And my team and I put together a diversified portfolio of recommendations to get our subscribers there first. Since last month's issue went out, EVERY SINGLE recommendation went up. That's 20 different recommendations – from high-growth tech stocks to boring bank stocks. If you want to take advantage of this stealth bull market in the safest possible way, then you want to buy China's major blue-chip companies (particularly the ones trading in Hong Kong, as they have more transparent accounting). These include China's major banks, insurance companies, telecoms, and oil companies. These companies are often trading at single-digit price-to-earnings (P/E) ratios. And they pay massive dividends today. Some of these Chinese companies are among the top 20 largest businesses in the world... Yet they're incredibly cheap today. Another example is Tencent... It's similar in size to Alibaba... and it had similar revenue growth – 52% year over year. I predict Tencent will become the world's largest company in the next five years. There's plenty of upside ahead. Unlike the U.S. stock market, the major Chinese stocks (trading in Hong Kong) haven't performed that well as a group... They're still down roughly 30% from their 2015 peak – even after a solid start to 2017. With poor performance for two years, and with Donald Trump's rhetoric, most investors have given up on China. This gives us an ideal moment to get in... China is hated, and a stealth bull market just appeared over the last month. Now is the time to take advantage of it. I believe Chinese stocks offer our best chance for hundreds-of-percent gains over the next five years. A basket of these blue-chip companies is the safest way to capitalize on the upside in China. Check out Chinese blue-chip stocks. Better yet, put some money to work in them – today. Bank of America is the second-largest bank in the U.S. with more than $2 trillion in assets. The company serves more than 47 million customers with 4,700 locations and 16,000 ATMs. It is also a leader in the wealth-management and global market research businesses. 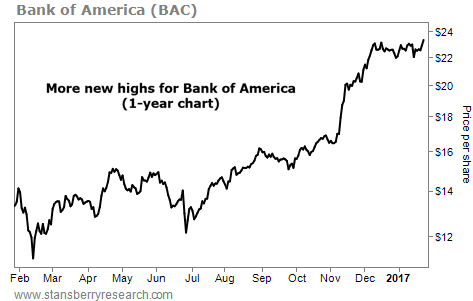 As you can see in the chart below, BAC shares have thrived in recent months, recently hitting new multi-year highs. They're up nearly 110% from their February 2016 lows. The financial sector is on fire... So keep these stocks on your watch list.